One winter afternoon in Vancouver, I sat at a cafe, drinking tea and writing in my notebook. Occasionally I’d open the novel I was reading, check my iPhone, or gaze out the window. After a while, my friend arrived. Amid our conversation, I noticed a grey-haired man seated nearby with an espresso and an almond croissant. He was neither reading, nor staring at a cell phone, nor people watching. Leisurely and without distraction, he was enjoying his croissant and his solitude. I immediately recalled Thich Nhat Hanh’s classic, The Miracle of Mindfulness, which discusses the importance of paying attention to whatever we’re doing. If washing dishes, focus on washing dishes. If eating a tangerine, focus on eating the tangerine, one wedge at a time. If, while washing dishes, we’re thinking about drinking a cup of tea later, “we are not alive during the time we are washing the dishes.” If we then drink the tea while thinking of other things, likewise we are not alive. We might be incapable of actually living one minute of life. A tangerine has sections. If you can eat just one section, you can probably eat the entire tangerine. But if you can’t eat a single section, you cannot eat the tangerine. Do you remember the tangerine we shared when we were together? Your being there is like the tangerine. Eat it and be one with it. Tomorrow it will be no more. 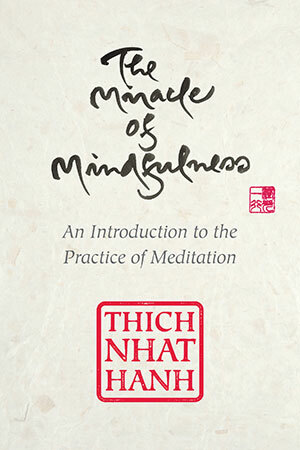 While the anecdotes and teachings in The Miracle of Mindfulness seem simple, they are difficult to apply. (When I first acquired this book, I skimmed through it, thought to myself, “These are commendable ideas,” put it away, and more or less forgot about it.) Is it possible to focus only on the task at hand? Can I be mindful while brushing my teeth, chopping produce, typing on my computer, day in, day out? When was the last time I ate an entire meal without distraction? Have I ever done so? When I take a first bite or first sip, my attention is sharp. But the next moment—even if tasting something extraordinary—my mind jumps to something else. Perhaps that’s because I’m typically eating while doing other things: talking to someone, listening to music, reading, checking email, and sometimes all of the above. More often than not, we simultaneously do multiple things. We think we’re good multitaskers. The omnipresence of cell phones has made multitasking possible anywhere. At the gym, I once saw a woman at the gym scanning her cell phone (in one hand) while doing sloppy dumbbell curls (in her other hand)—an obvious example of “doing neither.” Around town, I am unsurprised nowadays to see someone chatting away on a cell phone while walking a dog or pushing a stroller—oblivious to the dog or the baby. On the computer, even while writing or working, I click back and forth among numerous applications, taking mini breaks to view my calendar, reply to email, or scroll through Google News. I tell myself that I thrive on multitasking, but I’m really only procrastinating or, worse, using a fraction of my full brain capacity. Nhat Hahn acknowledges that active, working people haven’t the time to stroll along country paths or to sit beneath trees. His solution? Mindfulness need not be separate from work and everyday life—if we can be utterly focused on what we do. But being mindful in work and everyday life is a tall order. Nhat Hahn quotes a line from a Vietnamese folk song: “Hardest of all is to practice the Way at home, second in the crowd, and third in the pagoda.” Most people need a “practice”—such as breathing or sitting or yoga—to approach mindfulness at all. To apply one’s “practice” to work and everyday life, it’s probably wise to simplify. If I keep trying to do multiple things at once, I am only heightening then challenge of mindfulness. Maybe I must occasionally do only one thing at one time. I could start with an almond croissant. What a nice coincidence! Long before I finally read this book, a lawyer/mentor recommended it (perhaps sensing my need for it). Years passed before I acquired the book and then to read it, but the main point was always stuck in the back of my mind. I suggest that mindfulness is less about “paying attention,” maintaining “focus,” concentration, and disciplined attentiveness and more about letting go, remaining open to the next moment, and being responsive to the unexpected. Luci – the man with his almond croissant paints a lovely picture – something to aspire to! I find mindfulness a constant challenge and marvel at how we have “trained” ourselves to think that doing several things at once is laudable when research now shows people cannot multi-task effectively. Thanks for the post! Previous Previous post: Are you in touch with your breath? Next Next post: No offense!